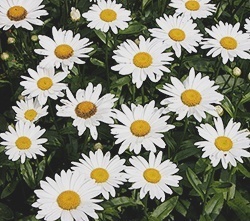 Gardeners love Shasta daisy flowers for their showy white petals around yellow centers. Easy to grow, this popular perennial is a standout in the early to mid-summer garden. Generations of children have used singe-flowered forms to play somebody loves me/loves me not, pulling the petals off one by one. The flowers have two forms, typical single daisies and double forms with frothy layers of cut and fringed petals. This lovely perennial has been hybridized for more than 100 years and there are dozens of garden-worthy cultivars. The flowers rise above low-growing, glossy green foliage. Newer varieties such as ‘Becky’, the 2003 Perennial Plant of the Year, have very sturdy stems and will not flop over after rain or wind storms. ‘Becky’ also stands up well in the heat of the south, and blooms from July to September, if spent flowers are removed. This perennial grows well in the North or South (USDA hardiness zones 3-8), but tends to be short-lived, and needs to be divided every two to three years for the plants to thrive. The best time to do this is in the spring. Dig up the whole clump, and separate into three or more divisions, and replant. (More division tips are here). This perennial thrives in rich, moist soil, as long as it drains well – especially in winter. These plants are heavy feeders, and will benefit from an application of liquid or granular perennial fertilizer in the spring, and again in mid-summer. Single flower forms need full sun, but double forms can take part shade. Tall cultivars often need staking to prevent flopping after summer rain showers. Spent flowers should be deadheaded back to the next flower bud, and all stems should be cut off when flowering is over to direct nutrients into the roots for winter storage.